Reagan slept through the night again (without the help of sleep medication). She woke up this morning just after 9am. She was in a great mood, stretching and smiling away...I love these good days. I spoke with her pediatrician and she wanted us to bring her in just to check her tummy out. Reagan was smiling and "talking" to the nurse, everyone was so happy to see her in such a great mood (usually she's miserable when we're at the doctor's office). The pediatrician came in and we were going over the happenings of the weekend, when all of a sudden I hear (and feel) it! Reagan hadn't peed or pooped all morning but now in the doctor's office she decides to let it loose! I laid her down on the table quickly and there was pee/poop going everywhere. We had to use paper towels to soak it up and prevent it from running off the table! It was a mess! Thankfully we were already in the room and were able to lay her out on the table and clean her up. The doctor thinks we need to try to stick to a daily regimen of laxative (instead of stopping it when she goes and using it when she doesn't). We're going to scale back her current dose of 3tsp Milk of Magnesia a day to 1-2tsp a day (and senna as needed). Hopefully we can get her on a more "regular" schedule. Reagan has been so precious again today. She's laughing, smiling, and vocalizing like crazy! Her speech teacher came this morning and was amazed to see her being so vocal! She's been making all kinds of sounds today, she's kept us entertained nonstop. I just love to see her like this. She's been trying to chew on that hand all day today. We had to keep it covered at all times to prevent her from accidentally biting it. She's also been very active. Constantly moving, rolling, grabbing her hands. She's been a ball of energy. I'm hoping that means she'll sleep well again tonight. Reagan went to bed fairly early last night...maybe 9:30pm ish...and then she slept through til 7:30 this morning. She's been a darling again today. Super sweet, smiley, and cuddly. This morning I was concerned because her belly looked even bigger and harder than yesterday. She wasn't peeing or pooping. Finally I decided to just put a glove on and assist her, and sure enough she was "clenching" and holding it in. The flood gates opened and lots of watery poop came out. Despite being prepared, it still resulted in a full clothing change. Afterward, her tummy was still bloated so I called the pediatrician on call. She was familiar with Reagan and even though I could tell she wanted us to go into the ER to get her checked for an obstruction, she agreed that it was probably best to keep Reagan away from all the sickies, so she told me to just give her some lasix and bring her into the office tomorrow. After I got off the phone with her around 11:20am I gave Reagan some lasix and not 2 min later she had a huge wet diaper. Another 30min or so later, she had another big wet one (lots of clothing changes today). Later on Reagan had two more poops and another wet diaper. At that point her tummy was finally back to it's normal size and was a lot softer than before. Whew! With all the issues Reagan has going to the bathroom, I don't ever remember her tummy being distended or hard like that! She really had me worried. Although by looking at her you wouldn't guess she had any sort of potty problems going on. She's been just as happy as can be. Big, giant smiling eyes all day. Sometimes it's hard to get Reagan to open those big blue eyes, but today she's been staring back at me wide eyed all day long. So precious. I sure do love this girl! The Apo-clobazam has been back-ordered from the manufacturer. Similarly, other manufacturers are currently unable to source quality material. There is a shortage of the clobazam chemical. The manufacturing process involves acquiring the chemical, then testing it for purity. If it is unsuitable, it is not used, and additional product must be obtained, and tested, etc. Then the tablets are made, and tested again. These are the rules in Canada, similar to those in the US. The Frisium brand is available because it is double the cost of anyone else and accordingly is not anyone's first choice. At this time, there are few if any options. As soon as the Apo brand is available, we will be switching back to it. We do not like switching manufacturers either, but to have no medication is not an option. You may give your daughter the Frisium with confidence. So the issue is, I obviously have NO choice but to just give her this new Frisium Clobazam and hope for the best. What I'm wondering is should I add the new one in slowly? I still have a week or so of the old stuff (actually a month...I just found an unopened box), I'm thinking maybe I should use half old and half new until we run out of the old and then just use the new. I can tell you...I'm not at all happy about this. But it seems there's not a darn thing I can do at this point. Hopefully it won't matter. Please keep it in your prayers that there is no difference between the old and the new. And keep it in your prayers that these good days continue! Reagan slept like a rock last night. She was up late. At 11pm, she was still WIDE awake. So around 11:15pm I gave her some clonidine and by 11:45pm, she was out. We were both in bed by midnight. Reagan didn't wake up until 9am or so. She woke up happy and smiling and has been smiling ever since. 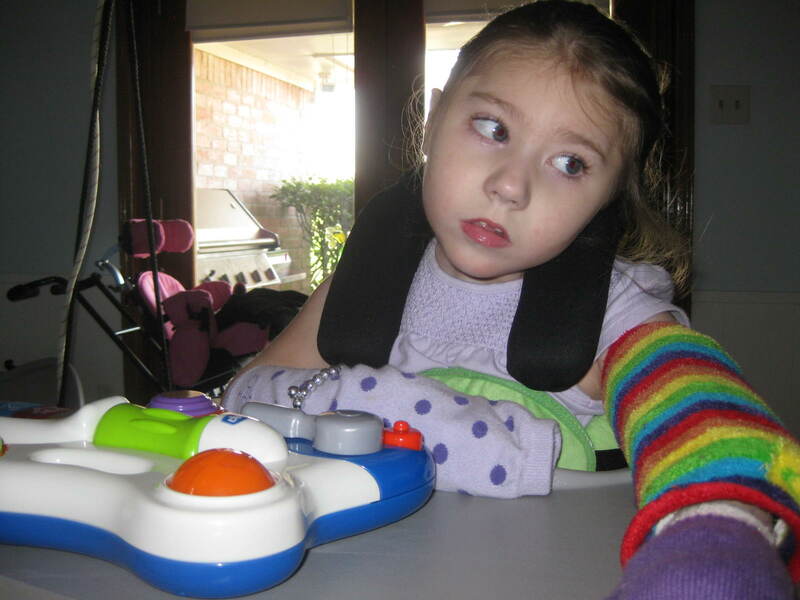 This morning she had both vision therapy and speech therapy and she did really well for both. I really like her speech teacher. She's young but very motivated and has great ideas on ways to help Reagan communicate. Reagan fell asleep right after speech and took a nice little nap. Then this afternoon we took her outside and let her swing for a while. She's not crazy about wind in her face, but she seemed to enjoy herself nonetheless. After our nurse left we took a stroll down our street with Grandpa and Bear (our dog). Reagan is so funny. The whole time she's got her legs bent, holding them out/up in front of her. All I could see is her little legs kicking around in front of me. Tonight Reagan definitely threw us for a loop. Out of nowhere, she's fine one second, next second she's puking up massive amounts of foamy spit! And afterward, smiling from ear to ear again. I did notice she was a little spitty tonight, I don't know if she's nauseous and that causes her to be spitty and eventually throw up or if she's just spitty and swallowing down more spit than usual and that upsets her stomach making her throw up. Who knows. She still sounds a little gunky, like some of it's trapped in her throat (I don't think she's brought it all up yet) and she's making some gaggy faces and having issues managing her spit. She acted like she was going to throw up again (making this horrible retching noise) but nothing came up. Poor thing. So weird. It seems like we're completely finished with "bad" days (and missed the whole nauseous phase) and then POW here it is, right in the middle of what I would definitely consider a "good" day. This girl. We just can't ever figure her out! I'm hoping she gets over this nausea and is able to sleep well tonight. Continued prayers are appreciated! 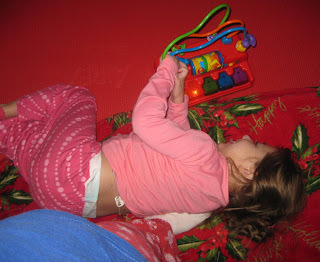 Playing with her piano this morning (with bed head). She was absolutely touching and grabbing it to get it to play. So sleep last night wasn't great, but it was much improved from the night before. Reagan fell asleep on her own, but woke 30-45min later. I gave her some clonidine and she fell back asleep...but that only lasted a short while too. So I decided to put her in bed with me and that worked out a little better. She still woke several more times but each time I just patted her until she fell back to sleep. We woke up for good at 7:45am when my Dad set off the alarm and woke us both up. Reagan has been in a great mood today. No fussing whatsoever. All smiles and laughs. Happy to just roll around on the floor. Still having quite a bit of chorea (and wanting to chew, not bite her fingers) and hands and feet are clammy off and on. So although some things are still "off", I would have to still call this a "good" day. Any day that Reagan is smiling and happy is a good day in my book (regardless of sleep). I spoke with the nurse for the special needs pediatrician today and the doctor has instructed us to continue with the Neurontin for another month (at full strength- 200mg 3x day). At that point we'll see if it's helping/changing the "bad" days. He's also calling in Lortab (tylenol/hydrocodone) to use on the bad days when she seems to be in pain. I told them about my suspicions of the morphine causing a slight allergic reaction and they want to just avoid it for now. He also thinks the Ambien is a good idea and we're going to use that on an as needed basis, especially during the "bad" cycles. I'm just hoping it works. So far nothing else has. So here's to a good day! We're definitely headed in the right direction. Keep her in your prayers for many good days (and nights) to come! Last night was brutal. Reagan went down but woke very quickly soon after and was up for the rest of the night. In the beginning she was still very fussy and fighting to bite her hand. Later on she dozed off a couple times, once for an hour and once for 30min, but I couldn't even attempt to move her for fear she'd wake up and start fussing again. So I sat up...awake...pretty much the entire night. She did mellow out a little as morning approached and I watched the clock waiting for 8am when the nurse would get here. At 7:45am I get a call from the nursing agency, they never call (right before a nurse's shift) with good news. Our Wed nurse's car battery was dead and she wasn't going to be in until later. I admit, I lost it a little. Some tears were shed. I was beyond the point of exhaustion. But I gathered myself together and had to somehow function for Reagan's sake. The nurse didn't get here til 11:15am, at which point I was so far past exhaustion, I had gotten a second wind. I did eventually try to take a nap, but was bombarded (once again) with phone calls while trying to sleep. I slept an hour here, 30min there, another hour here...certainly not enough to feel any better but at least I got some sleep. This morning Reagan was still having a fair share of chorea but as the day went on, she got more and more calm and still. She had OT and Speech today...and the speech teacher even got a laugh out of her! Since then we've heard some more laughs...a clear indication that she's on her way out of these bad days (that and the fact that her hands and feet are no longer cold and clammy). Tonight she was a little out of it and kept going in and out of sleep. I'm hoping that means we'll be getting some sleep tonight! Please continue to keep her in your prayers! Attempting some oral therapy with her. 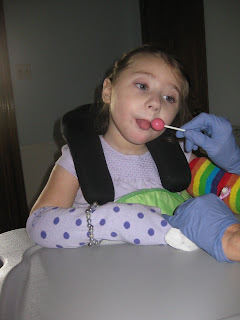 Trying to bite her right hand (since her left is in a restraint)! Reagan slept again last night. Whew! I'll take it. There were a few times I saw her moving around, but she always went back to sleep. She woke up around 7...I got up and changed her diaper...and she fell back asleep again. She woke up again around 9am. This morning she was a little groggy and fussy, similar to yesterday. But as the day went on (and after a big, humongous poop that ended up all over the place), she seemed to mellow out a bit. She goes through periods of being mellow and/or sleepy and then periods of fussy and agitated. Definite increase in chorea. Overall she's just very zoned out. Hands and feet are cold and clammy again. Another bad day. I'm hoping for less bad days this go round. After all, that's the point of her taking the neurontin. Today we increased it to the highest dose, 4mls 3x/day (200mg 3x/day). If we don't see an improvement in the length or severity of her bad days, then it's off the neurontin and on to something else. We're still not sure about the morphine. The only time we gave it to her, she may have had a slight allergic reaction and it didn't seem to help in the least. Still looking for something that works on our girl. She's a tricky one. Please continue to keep her in your prayers. Reagan fell asleep last night on her own. I made my way to bed probably an hour or so later. Literally 2 min after I laid down, I heard her moving around. I looked at the monitor and she was moving a lot (it looked a little seizureish to me). I was a concerned so I ran in there and she had stopped moving but was sort of zoned out. I couldn't really get her to snap out of it so I picked her up and brought her into the living room. She was still very zoned out, I kept saying her name and covering her eyes, trying to get some sort of response out of her. It took a few minutes but finally she seemed to snap out of it. She laid there for a little while longer looking around and then she fell back to sleep. I put her in bed and she slept through til morning. When she woke up this morning at first she was fussing and then she started doing the same sort of zoned out thing again. I picked her up and she was calm but still a little out of it. Then she fell back to sleep again. She was up and down all day today. One thing's for sure...when she was awake...she was fussing or crying. Today was definitely what I would consider a "bad" day. The second she woke up, she was going for that hand like a little piranha! We've had to keep her double gloved all day. Thankfully she slept a lot, that gave us a nice little break from all of the craziness. This last stretch of "good" days lasted 7 days (an all time record)...so I'm hoping maybe we'll see less bad days this go around. Please continue to keep her (and us) in your prayers! Reagan was up a lot last night. She woke up only an hour or so after falling asleep. I was only in bed for maybe 15min (and still hadn't fallen asleep) when she woke back up at 11:40pm. I got up and found a very startled and tense Reagan. I picked her up and we sat in the living room. She settled down after a while and then was happy and laughing again. I stayed up with her til 3am when she finally fell back to sleep. She woke an hour later and then it was Daddy's turn. I'm not quite sure if she ever went back to sleep. I remember hearing her laughing in her room and when I woke at 8am she was completely uncovered and moving around in her bed. The most surprising thing is that she's actually been in a good mood today. After last night we were expecting the worst, but we were definitely pleasantly surprised with the smiles and laughs we got today (see video from yesterday's post). We even took her outside to swing on her outdoor swing today, the weather was so nice. She's still having her tense moments and she was grinding her teeth tonight. She's also been very spitty. We first noticed it yesterday, but she was super spitty today as well. We're definitely having to be more cautious of what she's doing with her hand (or hands) because at some point she'll go from just putting her fingers in her mouth to biting the you know what out of them! She's also really been grabbing at her hair a lot with that left hand. I can't tell you how many times we've had to untangle those clenched fingers out of her hair! 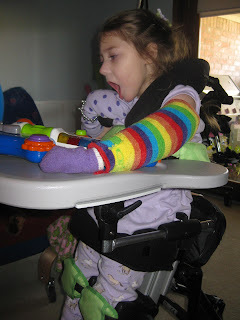 Friday we spoke to the orthotist about making something for her hands to prevent her from biting herself. He said they can definitely make something for her (but until we have it, who knows how well it will work). I am going to call her doctor on Monday to get her to write a "prescription" for it so we can move forward with getting it made. Please continue to keep Reagan in your prayers...more good days please! Last night Reagan fell asleep on her own but then woke around 3:30am (when mommy got up to go to the bathroom...I swear she can sense it when I'm awake). She laid there for another hour and a half or so, moving around and "talking" to herself. I finally decided to get up with her at 5am because she had the hiccups and they wouldn't seem to go away (she actually had lots of hiccups today). We sat up until 6:40am when I had to leave for the airport to go pick up Grandma. Right as I was leaving she started to get the giggles. By the time we got back from the airport, Reagan was laughing nonstop (see video below)! Lots of talking, lots of laughing, lots of smiles...it never crossed my mind that things would turn sour. We went to her orthotic appt to pick up her new leopard AFOs and everything went smoothly. A couple times in the car I heard a slight hint of craziness in her laugh but didn't think much of it. It wasn't until the nurse was about to leave today that I heard Reagan's laugh cross over into a cry. Bad sign. Immediately I thought about how each of her last couple bad streaks had a day of nonstop laughing that preceded them. The rest of the night she was on edge. She was either laughing or crying. It was obvious she was tired...she'd been going nonstop since 3:30am this morning...but she never nodded off even once. 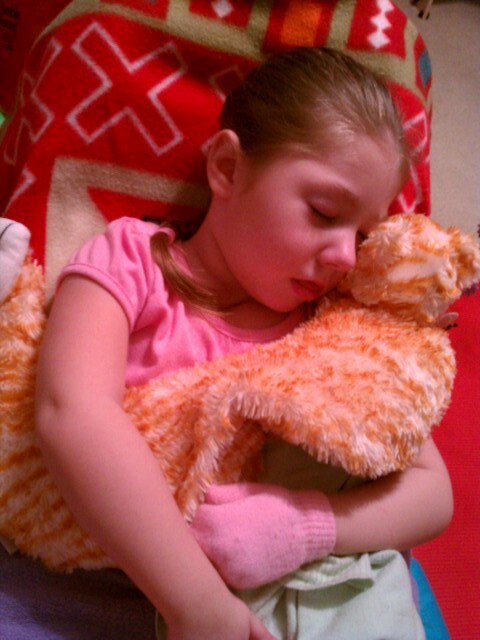 It wasn't until we gave her the clonidine that she finally fell asleep. Now we're all walking on egg shells. We really want her to stay asleep, but we know how this story goes. I'm afraid we're in for some rough days again! Please keep her in your prayers. Reagan has been a sweetie again today. She slept through til 6:30am and woke smiling once again. She's been very smiley and "talking" here and there in that sweet little voice of hers. She's been very "rolly". On the floor she'll turn herself completely around clockwise. Even when you're holding her she'll crunch forward like she's trying to roll out of your arms. She was very alert and had pretty good head control today as well. Two of her therapists canceled today, which is unfortunate, we really need to take advantage of these good days! 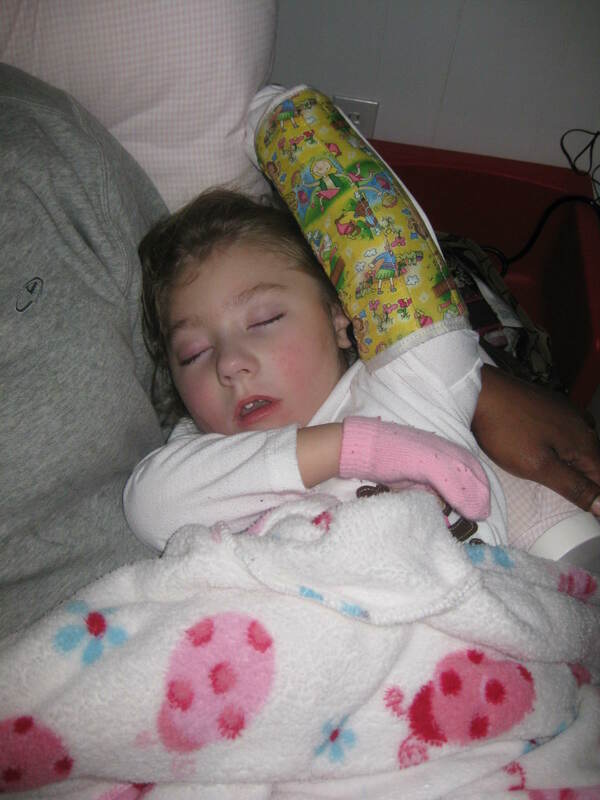 But her PT and the speech therapist from the school did make it out so at least she had some therapies. She also stood in her stander for over an hour without a peep. We noticed tonight that Reagan's hands are a little cold and clammy. I'm hoping that's not a sign of things to come. Grandma flies in tomorrow morning and is anxious to spend some time with this sweet girl! (I promise to post some pictures tomorrow...Grandma always takes tons!) Please continue to keep our little one in your prayers for more good days! Reagan has been a total doll all day today. She slept like a rock last night (thank you God) and then she slept in all morning. We finally had to wake her at noon so we could get her ready for her doctors appt. Today she woke happy and smiley (unlike yesterday). Our appt was a routine follow-up with her neurologist and it came at just the right time because we had some things we needed to discuss with him from our appt yesterday. We mentioned the meds the pulmonologist/sleep doctor brought up and he's going to run them by the people at TX Children's sleep clinic. He seems to be leaning more toward trying either Ambien (although it's a benzodiazepine and she's already on one benzo already) or Haldol (which he said may also help calm her crazy movements). While we were there he thought we should also have some routine labs run. After our appt we went down to the lab and that's when things got crazy. Apparently the doctor filled out the wrong lab slip, so they spent the next hour and a half trying to straighten that out! We waited longer in the lab than we did for our appt! Then once they figured all of that out they "attempted" to draw her blood. I showed them her one good vein (the one that ALWAYS works) and the girl hit it but obviously lost it. I told her that they had one more shot and that she needed to find someone VERY experienced to do it. So we waited another 30min til Jose came back. Thankfully Jose knew exactly what he was doing and got it on the first stick! Reagan was SO good through it all. She never made a peep. She's such a trouper! Tonight our nurse stayed late so Mike could come and watch me lose my tennis match. Reagan fell asleep right after we left. She kept smiling in her sleep! Her nurse took pictures, but we saw it first hand when we got home! She's such a cutie! I love this girl! It's been another weird day for Miss Reagan. Last night she fell asleep (with the help of clonidine) and then slept the whole night through. She was actually still asleep at 10am when we had to wake her so that we could go to her appt with the sleep doctor/pulmonologist. She woke content (not necessarily "happy" or smiling...but content) and we changed her clothes and jumped in the car. She was definitely still trying to get her fingers in her mouth (and still very spitty) and having more chorea than I would expect. We got to the doctors office without any problems (this is the same doctor we went to see last week when Reagan's tube was yanked out in the parking lot). It wasn't until we were in the office with the doctor that I noticed Reagan getting more tense. The chorea picked up even more so and then her face turned beet red and she started screaming. Next thing I notice drips on my feet...she's peed and it's leaking out the top of her diaper down onto the floor. I immediately transferred her to the examining table and we stripped her down from head to toe and put new clothes on her. The whole time she continued crying. 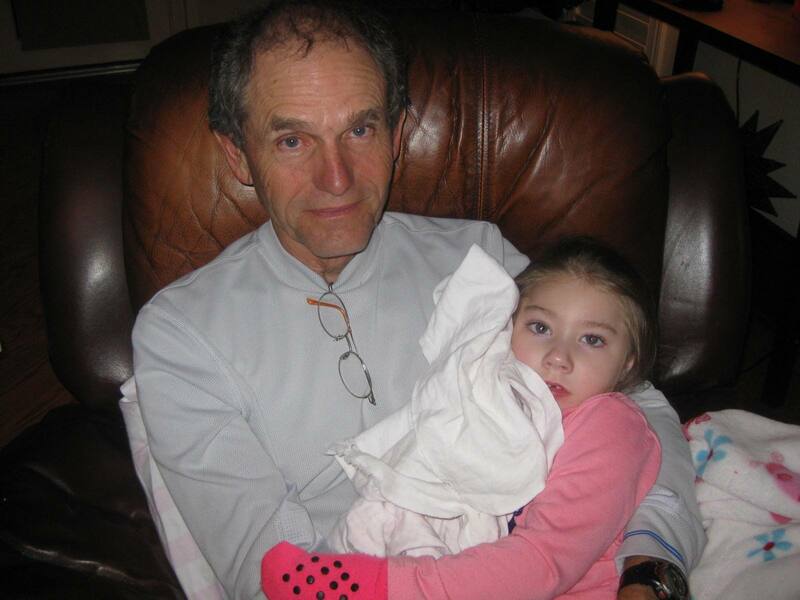 Afterward, as I was trying to talk to the doctor, the crying continued. She was not a happy camper. I mentioned to the doctor that Reagan was not really tolerating the nasal cannula with oxygen and I asked if we could try doing blow by oxygen with her (where you just blow it near her face). It won't get her the correct amount of oxygen she needs, but some is definitely better than none, so she's going to get back to me on what sort of device we need to use and we're going to try it! We also talked about sleep medications. She mentioned things like Lyrica, Ambien, and even Haldol (or newer versions of it)...but she really wants us to talk it all over with her neurologist first (because she doesn't want anything to interfere with her seizure control). I agree...having something we can give her to get her to sleep is VERY important. For all of us! Anyway...I guess we'll see what her neurologist says. This afternoon Reagan was a real turkey again! She never went back to sleep and when the nurse left and handed Reagan over to us...she decided she didn't want me OR her Daddy! She kept crying and giving us the pouty lip! It was so sad! We did finally get a picture of it. What's crazy is that after about 30min-1hr of that, she calmed down and was smiley for the rest of the night! We just have no clue with this girl! Mike made a nice Valentines Dinner and we managed to eat in peace without any tears. Then tonight Reagan fell asleep while laying on my lap (without clonidine). Sometimes she can be such a little angel (and other times quite the opposite)! Reagan was up again all night last night. She fell asleep on her own but was awake 30min-1hr later. I tried the clonidine but it didn't do anything. She was content to just lay in her bed (allowing us to get some sleep), but she was moving nonstop all night long. When I got up with her this morning I noticed something different. I was able to get her to laugh at something. She was interacting with me (for the first time in days). Since then she has been laughing nonstop! Anything we say, any noise we make...she laughs at it. It's so great to see her feeling better. She's not 100% yet...she won't be until she gets some rest...but she's headed in the right direction. She's been very spitty today...drenching bibs and blankets. This morning she did have a big throw up but I think it was just from all of the spit. She hasn't really had any nausea whatsoever today and hasn't thrown up again since then. She's still trying to get her hands to her mouth nonstop but she's not biting her fingers (although it still makes me nervous). Her hands and feet are even returning to normal temperatures. Now all she needs is some sleep! Serious sleep. I'm guessing it will come either tonight or tomorrow. Those eyes are tired eyes. Please keep it in your prayers that she can finally get some good rest and bring on those good days!!!!! Today has been very similar to yesterday. Reagan is still very tense. Way too much chorea. She can't hold still for even a moment. Last night she just laid in bed moving, moving, moving. 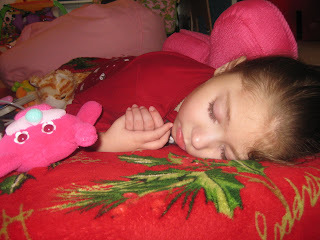 She was quiet, so at least we were able to get some sleep, but I just hate it that she couldn't rest at all. I've kept her in her arm restraint all day again. She somehow still manages to wiggle out of it from time to time. Today while I was holding her she managed to get it off, so I figured I'd just hold onto her hand to give that little arm a rest for a while. All of a sudden I heard the snap of her glove...but no crying. I figured maybe she just bit the tip of the glove, sparing her fingers. I decided to look (just in case) and sure enough she got the tip of her left middle finger and it was bleeding. Ugh. I just don't know what to do with this girl. We can't win for losing. Her hands and feet are still ice cold and clammy. She's still very zoned out and stressed. I'm hoping tomorrow we'll start rounding the corner to good days ahead...but as of now, there's no sign of them. Please continue to keep our little one in your prayers! Reagan was up and down a lot last night. 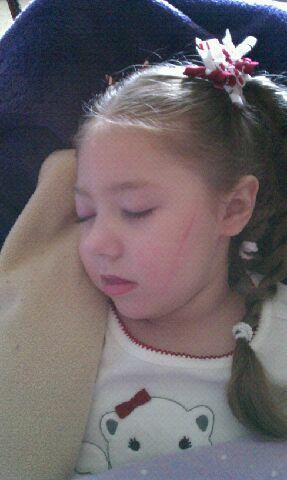 Again...I am thankful that at least she went down for short periods of time...but we are all running on empty here. Today she's been very stressed. Wide eyed with that dazed look. Arms and legs constantly moving. Holding her is a full body workout. Her stress transfers over to your stress, which is very stressful! Her hands and feet are also ice cold and clammy. It's a typical "bad" day. She's had quite a few dirty diapers today...three to be exact. Only one big one but still. We haven't given her any laxative since Tuesday (and she's had at least one dirty diaper a day since)...I guess it worked. I'm not sure if it was the milk of magnesia or the "little tummies" senna. Either way, it seems to be working better than previous methods. It's 10:45pm and Reagan just fell asleep on her own (we'll save the clonidine for later...I know we'll need it)...time for me to go! I have to sleep when I can! Please keep her in your prayers! Where do I start? Last night Reagan was up and down all night. On a good note...at least she went down. On a bad note...she'd only sleep for maybe 30min or so and she'd be back up again, crying. Not a good night. Then today she's actually been worse. She was still very sleepy but she'd fall asleep, only sleep an minute or two and then wake up screaming again. Poor thing, you could tell she was tired, but she was SO restless (her little hands would twitch while she was sleeping). Lots of crying today. And moaning. Crying and moaning literally every waking moment! Constantly trying to swipe at her face and bite her hands. Kicking and fighting you nonstop. We did give the morphine a try but didn't notice any difference (if anything she was even more irritable afterward). She may have had a slight allergic reaction to it. We noticed her nose and her chin was very red (but that could have been from rubbing it) and then later we noticed some red blotches on her chest (but that could have been from crying nonstop)...who knows. Then this afternoon we headed out for the sleep doctor (pulmonologist). By the time we got there Reagan was hysterical, turning blue from so much crying/breath holding. I was rushing to get her out of the car because it was so cold and I did something I never do. I pulled her out without first getting her backpack/feeding tube. That's my motto...tube/backpack first and then Reagan. If you follow this order, you'll never go wrong. Unfortunately, in my haste, I went to the other side of the car...the side I never take her out on (because there was less wind on that side) and I pulled Reagan out and POP! Out came her gj-tube! 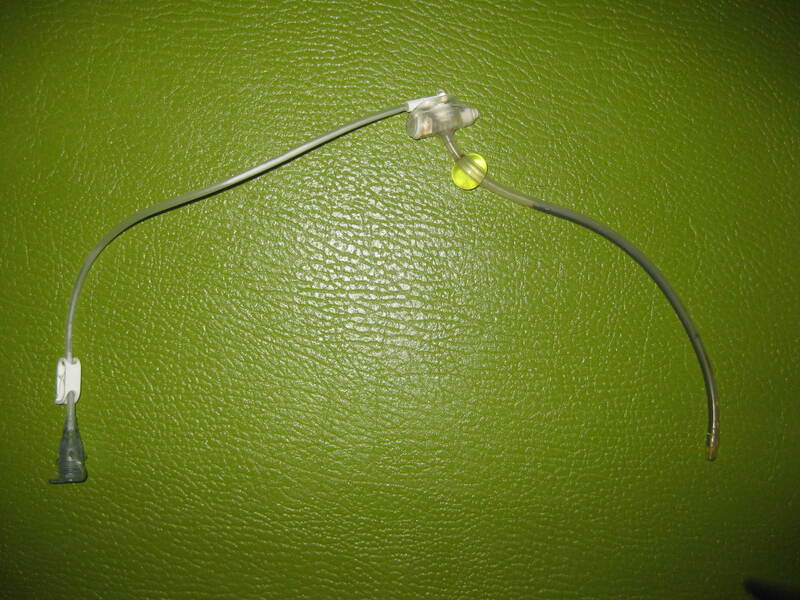 Of course this has never happened to us before and a gj-tube coming out is a much bigger deal than a g-tube (which you can replace yourself). I've never been so frantic in my life! I ran her into the doctor's office and forced my way into a room. The doctor was standing right there and she came to my aide. Of course we don't carry our back up g-tube with us, so we had nothing to put in the hole (if you don't put something in it, it will close up in 30min to an hours time, requiring a surgery to redo it). The doctor used some sort of drainage tube they had and then had to tie it in a knot to keep it from leaking everywhere. She also taped it all down on her tummy to make sure it stayed in. While the doctor was doing all of this, I was on my phone calling Texas Children's. It was almost 4pm and I knew we had to get her there ASAP to get in before Interventional Radiology closed and in order to avoid the ER. After talking to several different people, I finally was transferred to a nurse that was able to get it set up. We jumped in the car and drove 30min through traffic to get there (of course this happened at the ONE doctor's office that is not in the medical center). They all stayed late to get us in and replaced Reagan's tube without a problem. Then we headed back home through 5 o'clock traffic. Reagan continues to be very moany...of course she does have a reason but the longer you have that nonstop moaning in your ear...the more irritated you get with it (and her). We all need some sleep. I'm guessing she's going to have a night similar to last night and no one is going to get much sleep. I sure would like to be surprised about that. Please keep her in your prayers. She sure is having a rough time right now! The part on the right is what was in her tummy (the long tube was fed all the way into the upper portion of her small intestine). So all of that, even the big inflated balloon, came through the little hole in her tummy! Poor girl. After our crazy day yesterday the last thing we thought we'd be getting is a good night's sleep. When I gave Reagan her clonidine she was still going strong...kicking, yelling, and fussing. About 20min later she was out cold! We couldn't believe it (and still thought in the back of our minds it would only last 30min or so). Amazingly enough she slept the whole night through. I think I remember her waking up once, fussing, and then going back to sleep on her own. This morning she woke ANGRY with a scowl on her face and crying. Thankfully she's been super sleepy most of the day and slept A LOT...but when she was awake, she was crying. Very irritable. We had one appt that we had to get to this afternoon, a 6month dental check up, and due to the nasty weather we were one of the only people to show for the day. It was the quickest appt at Texas Children's we've ever been to. We got there, they took us straight back, about 5min later the dentist came in, pried Reagan's mouth open (I'm sure that was a pleasant thing to wake up to), and then sent us on our merry way. He said other than some minor tartar build up (from not eating by mouth), her teeth look pretty good! Yeah! I was happy to hear that! I was also happy that we made it back home safely before the roads started icing over. It certainly has been a weird couple days. Looking back though, this is exactly how our last streak of bad days started. Reagan had a day where she was crazy and laughing the entire day (not exactly what we had yesterday but the crazy was there) and then the next day she was very fussy and slept for most of the day. We've been super cautious, keeping her arm restraint on her at all times (and gloves), so hopefully we'll avoid another finger injury this time around. Tonight Reagan was awake for a longer stretch of time and she was super fussy and moany. It's amazing that she can still (somehow) bend her arm in that arm restraint. Not quite enough to get her finger into her mouth, but enough to swipe at her face with her hand! Like I said, this child has super human strength! Right now she's asleep on the recliner in our living room. I'm hoping we can get her to bed tonight and praying that we all get some sleep. I just hate seeing her miserable like this! Last night wasn't a good sleep night. Reagan was very restless and I'm not sure how much (if at all) she even slept. Her pump decided to go haywire around 11:30pm and let me tell you, the cuss words were flying! It kept saying "No Food" even though it had a full bag of formula (and no clog). Finally I just had to empty the entire bag into a new bag and it finally started working again. It's a good thing too...because I almost threw it through a window I was so mad! Needless to say, Reagan did not go back to sleep after all of that. I sat up with her multiple times but each time I put her back in bed she either immediately woke back up or never fell back to sleep to begin with. Thankfully she was in a good mood, but that's not much consolation when all you want to do is get some sleep! It was a long night. We had an early start this morning with an 8:30am appt with the special needs pediatrician. Apparently we have a lot more room to increase the neurontin (right now she's at 80mg 3x/day...he said she can go up to 200mg 3x/day)...so that's what we're going to do. Over the next couple weeks we'll increase the neurontin up to the max and see if it helps with her bad cycles. Meanwhile we're going to try giving her morphine on her bad days to see if it can alleviate some of the discomfort she experiences on those days. I'm not sure how I feel about giving her such a major pain med, but if it can help her, I'm willing to try it! Reagan was smiling away at the doctor during her appt. At first I was afraid she might start crying when he spoke to her (like she does for Daddy) but she was fine. She just smiled and kept trying to roll off the examining table. Tonight when Daddy got home she did give give him the pouty face again and then exploded into tears! She's definitely hurting Daddy's feelings. Well, it's time for bed and Reagan is no longer looking sleepy (she should be, she didn't nap at all today). Time to break out a full tablet of clonidine. Keep it in your prayers that we can get some sleep tonight! We put Reagan to bed last night and she seemed to be out. When I went back in to hook up her feeding pump (and consider putting the CPAP on her), she immediately woke up the second I touched her covers. I hadn't given her any clonidine, so I went ahead and gave it to her. She fell asleep 15min or so later (but I gave up on trying to get the CPAP on her). She really hasn't been sleeping very soundly lately. It's hard to get her to wear the CPAP when she's restless during the night. I sure wish we could find something to reliably keep her asleep. Mike thinks the clonidine helps her fall asleep, but it doesn't keep her asleep. We all could use some more consistent sleep. Reagan woke around 4:30am with a super wet diaper. I changed it and then went back to sleep. She eventually fell back to sleep because when I got up at 7:30, she was still out. Reagan has been in a weird sort of mood today. She's been very sensitive to noises and started crying multiple times when Mike sneezed! She's also not loving her Daddy today. He picked her up this morning and immediately she started crying. Or tonight when he was watching the football game, he yelled out about a missed catch and she got hysterical! Other than that, she's been in a pretty laid back mood. Still very busy with her hands, constantly trying to put them into her mouth or pull her hair with them! But she has been smiley, sweet, & cuddly too. I hope she's in a good mood this next week...we've got a jam packed week of doctors appts. Only one appt per day, but that's still a lot. 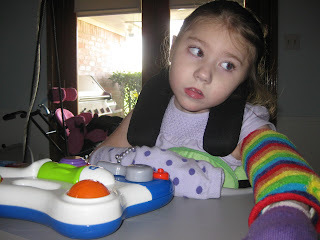 Tomorrow we go back for a follow up with the special needs pediatrician to talk about the neurontin (which doesn't seem to be doing anything). 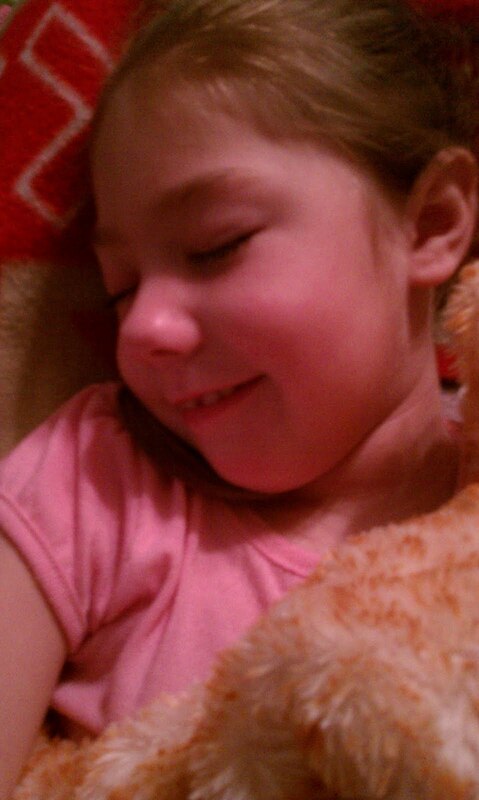 Please keep it in your prayers that she gets a good night's sleep tonight and wakes up with smiles! Reagan wearing her energy for life walkathon t-shirt (since she didn't get to "walk" in it)! Notice the bling that grandma added to her shirt! Reagan slept like a rock last night. I didn't put the CPAP on her until sometime between 11-12pm but then she slept with it on til 9:30am. She started moving around and I thought the CPAP was bothering her so I took it off, but as it turns out it was her hand stuck in her hair that was giving her trouble. Her poor little lips were all crusted with white stuff...I guess she was really spitty and the CPAP just dried it up all over her lips. She slept til 10:30am...woke up all smiles...and then was back asleep an hour later! She eventually woke up and was just as sweet and as smiley as can be! She's been a little floppy today but who can blame her, she's recovering from some pretty rough days. I'm just excited that we're all getting some sleep again! And the smiles! Oh how I love those smiles! On a bad note, our walkathon (which was supposed to be tomorrow) was canceled. The weather here in Houston has been pretty nasty from this "winter storm". We were supposed to get a light dusting of snow but that didn't happen, instead we got ice. Last night the roads iced over and there were over 800 wrecks in Houston today! Thankfully our nurse spent the night with us last night to avoid being out on the roads this morning. It's frustrating that we aren't going to get to "walk" this year (it would have been our first year to participate), but we did raise a lot of money for our cause. Everything isn't entered in yet, but in the end I think our team is going to end up with over $7500 in donations! Pretty amazing! Thank you everyone for your support! Cell phone pictures, so pardon the quality. We put Reagan to bed last night at midnight. She was sleepy but not asleep. I watched the monitor and eventually she stopped moving and went to sleep. I have a feeling she didn't sleep too soundly but I was OUT and didn't wake up until 5am when I heard her coughing. I ran in there thinking she was choking and she was just laying there smiling away! I picked her up and we were up for the day. She was just as darling as can be, smiling at me with those big blue eyes. 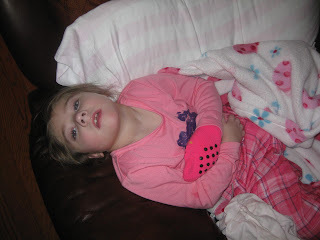 She was a still a little nauseous but it was obvious the bad days were on their way out. She started getting groggy just in time for speech therapy and once her therapist left...she was out. Her PT still came and stretched her feet out a little but Reagan slept the whole time. And she's still sleeping. I guess this is her catch up day for sleep. I'm going to hook her up to CPAP soon, so at least she'll get the best quality sleep possible. Lord knows she needs it! She's so funny. She's sleeping in her bed and we're listening to her monitor and she's making sucking noises with her mouth. Poor girl hasn't had a bottle in over a year but she's still in there sucking away. Here's to the return of good days! Now if only we could get a little warmer weather! The walkathon is quickly approaching and we're supposed to have snow tomorrow! It NEVER snows in Houston! Talk about timing! Today I have been definitely running on empty. Tonight it is really hitting me hard. My eyes are heavy and sore. I'm hoping and praying for some sleep tonight for us all. Reagan was up again the entire night last night. She never fell asleep for longer than 15min and that was only once. She was still having lots of chorea and the occasional outbursts of what we believe to be chorea (where she'll go crazy with the movements for a bit and yell out)...not fun. She also had a good 4hr period of extreme crankiness, from 2:30-6:30, which made it very difficult to be patient with her. Today I attempted a nap but I seriously must have gotten 20 phone calls during that time, so eventually I just gave up on the idea of a nap. This afternoon Reagan got a little gaggy and retched a few times and had one big throw up. As sad as it is, we're always a little excited to see her nauseous because it means that we are nearing the end of the bad cycle. Unfortunately she had a little more nausea than usual and tonight she threw up so many times I lost count. We went through 4 blankets, completely soaked through. Poor thing. But you know what...she's even giving us laughs tonight! So I know she's about to turn the corner! So good to hear my girl laugh and to see that recognition again in her eyes. I'm hoping for a good day tomorrow. And some sleep tonight. Oh that would be sooooo nice! Please continue to keep her in your prayers! Last night was a super long night! Reagan fell asleep around 11:30pm, we were in bed by midnight, and then Reagan was back up by 12:30. Not only was she up, but she was beyond cranky. She cried, kicked, and screamed nonstop for the next 3hrs! I was about to pull my hair out! For a while I was worried maybe she had seriously hurt herself (she was so hysterical), but Mike thinks it was all just a big temper tantrum! Finally around 3:30am the crying stopped, but the chorea was (and still is) out of control! Imagine holding a typical 3yr old on your lap that doesn't want to be there...now imagine that kid with super human strength, enough to kick her way out of your arms! That's Reagan. It's a full body workout trying to hold her when she's like this. She never dosed off more than 5-10 min the entire night. Mike got up with her from 5:30-7 so I could get a little sleep. Of course when I got back up I found her in her brown chair with a weighted blanket over her hand and her Daddy asleep on the sofa next to her! Reagan's nurse had a doctor's appt this morning so she didn't get here till 10:30am. We got Reagan dressed and loaded her up to go to the pediatrician (just to get her finger checked out). The doctor confirmed that it didn't need stitches and just told us to keep an eye on it. She bandaged it up and then Reagan promptly found her way out of the bandaging as soon as we got home. Mommy took a nap while Reagan had both OT and PT. I'm sure not a lot of real therapy going on, but at least it distracted her a little. She's still just so tense. Zoned out with sleepy eyes. She's been sticking her tongue out a lot today and had a few little retches...but not really gaggy per say. I SO hope we're almost done with these bad days. They're exhausting! Please continue to keep our little one in your prayers!